We have made some changes to one of our exam rooms in order to be a little more cat friendly. 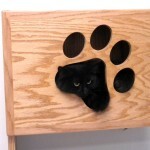 We added some great cat “furrrrrrrniture” and have had several patients taking advantage of the new hiding places. Maggie in the image above was the first patient to try it out!